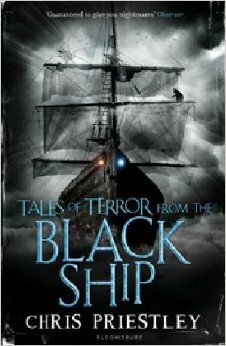 This book is called ‘Tales of Terror from the Black Ship’ by Chris Priestley. It is about 2 children called Ethan and Cathy. They are immensly sick and are left at there home, The Old Inn, while their father goes out to fetch some medicine. But all of a sudden they begin to feel sleepy, so as you or me might do, they went to bed. They wake up light-headed and someone is knocking on the door. They go over to the door and instead of their father standing their, there is a stranger, soaked by the lashing rain. They let him in. He sits down and tells them stories, ones that they will never forget. I adore this book sooo much. My favourite part is the ending. It is so sad and you will cry at the end, I can asure you!! I feel this books genre is horror because it is genrally grisly cover to cover.